Nutrition Expert Vicky Pearl’s new cookbook provides delicious solutions for cooking gluten and dairy-free. As a practicing nutrition coach, Vicky has been helping people eat better for almost two decades and has been at the forefront of the gluten free movement witnessing firsthand the amazing health benefits that following a gluten-free diet can incur. 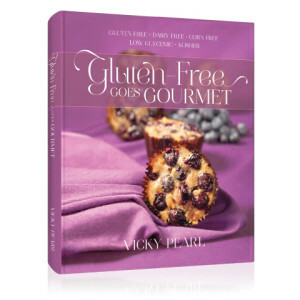 Gluten Free Goes Gourmet has something for everyone for any occasion and run the gamut from Dips & Drinks to Stellar Side Dishes, Magnificent Mock Dairy to Marvelous Meat & Poultry, and Breads and Desserts. Recipes include: Chicken Soup & Knaidlach; Brisket & Chicken Rollups; Baked Salmon in Marinade; Mock Cheese Blintzes; Creamy Eggplant Dip; Broccoli & Carrot Salad; Potato Kugel; and Moist Honey Cake, to name only a few. Vicky also provides extensive information on pantry items and ingredients. 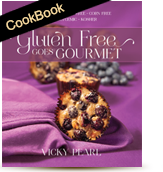 Gluten Free Goes Gourmet is an indispensable tool for anybody interested in cooking and eating gluten-free. With the holidays just around the corner, this is the must-have cookbook.